Our celestial bandana has a Suns, Stars, & Moons design. The colors on this bandana are absolutely electric. 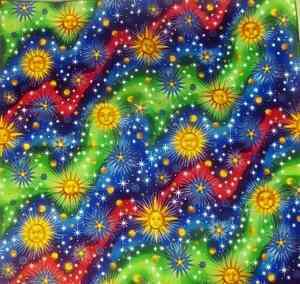 High Quality and filled with bright vivid colors in a psychedelic celestial dance! 22" square and made of 100% cotton. Great for festivals and when camping! I love this bandana so much, I decided to use it as a wall hanging...it's THAT pretty!!! Cheers up the room :). Great price!